Sculptor and performance artist working in video, installation and action art; combines the visual experience with suggestive socially-minded messages. In his art Polish artist Pawel Althamer combines the visual experience with suggestive socially-minded messages. His artistic practice is based on a participative approach to art, founded on the belief that art can impart change. Since Althamer’s focus is on the communicative and community-forming power of art, some of his works leave hardly any material trace, based on the live sculptural and performative traditions. He studied at the Warsaw Academy of Fine Arts between 1988-1993, earning a degree in sculpture under Prof Grzegorz Kowalski. In 1991, he began exhibiting his works, along with colleagues from the Kowalski studio, including Katarzyna Kozyra, Jacek Markiewicz and Jacek Adamas. He was a co-founder of the Kowalnia ("Smithy") group, a leading collective of young Polish artists in the 1990s. In 2004, Althamer received the prestigious Vincent Van Gogh Biannual Award, founded by the Broere Charitable Foundation of the Netherlands. From the beginning of his artistic career, Althamer worked in various media, from classic performance techniques, happenings and "action" art to the discipline he founded his education on: sculpture. A number of his installations have used sculpture as an element of the piece, such as the self-portrait he submitted as his Master's project at the Academy - Paweł Althamer, 1993 to the balloon likeness of the author suspended above the city of Milan - Balloon, 2007. The materials he employs may often be atypical for the medium, but there is often a reference to the roots of his art education. Sculpture in the hands of Althamer carries a totemic or fetishistic quality - it is no accident that a 1991 trip to Africa played a major role in shaping the artist's creative personality. His early works Standing Figure, 1991; Nature Study, 1991 made out of grass, straw, animal hides and innards are a testament to this influence, particularly the hyper-realist portrait of the artist that was part of his Master's project. The work itself carries a double message, referring to both the age-old academic requirement to demonstrate the artist's artistic ability to create mimetic representations of reality, but also serving as a literal substitute for the author at the defence. The figure was to stand in for Althamer before the committee of professors while the artist himself left the room. A video was played showing the artist leaving the academy, heading towards the woods to strip off his clothes and "commune with nature" while the figure remained. A similar technique was used in the depiction of Althamer's family members, e.g. Paweł and Monika (2002) and Weronika (2001), a figure of a girl standing in a barn in an Alpine village, a girl's skull inside the figure's head. In 2006, he also created a small-scale sculpture of his newborn son, along with several miniature models of reality that resemble doll houses in the years following, including a replica of the Foksal Gallery Foundation office, employees included). For a few years, he and his wife earned their living making rag dolls which they sold through souvenir and toy stores. Today, he continues to teach ceramics workshops for Grupa Nowolipie, a group of patients suffering from multiple sclerosis and other diseases. Althamer's sculptures emphasise the organic nature and physicality of the human body, along with its impermanence and the temporary nature of man's existence. His technique counterbalances his search for alternative ways of experiencing reality, discovering an "inner life" and "altered states of being" mostly through ascetic isolation, but also with the help of narcotics or hallucinogenic substances. In his 1990 work Connection of Two Points, he and fellow student Mikołaj Miodowski attempted to play a telepathic game of chess In the 1990s, especially during his student days, Althamer conducted numerous (often lengthy) performances that involved radical sensory deprivation. When the rehearsal takes place in public, it becomes a spectacle, a means of communicating one's exploration and that weakens the experience. I lose sight of the question and start to transmit a response. My most powerful experiences occur beyond art, beyond creation, and they are utterly spontaneous events. The sound of people riding in a horse-drawn wagon comes to my ears. I recognise them, these are people from here, from the village. I hear they've noticed something and are intrigued. They think I'm a snowman made by the students. (...) Pain in my spine and limb numbness, the cold doesn't bother me so much, cause me to stop. At another time the artist deprived his body of sensory stimuli by encasing himself in a plastic bag slowly filled up with cold water (Water, Time, Space, 1991). A material manifestation of those experiments were, for instance, The Boat and the Spacesuit (1991), sculptures that were meant to serve as meditative tools. According to the artist, these objects were intended to present the body and soul in a tangible, physical manner. You could also perceive them as instruments for practicing dying. The boat would be an equivalent of the coffin, and the spacesuit - of the body. Ten years later, Althamer built a Tree House (2001) in the centre of Warsaw (in the immediate vicinity of the Foksal Gallery Foundation office). For him, this was a place of solitude and "wildness" located in the very heart of the urban agglomeration and it functioned there for a few months. Althamer's happening in Berlin in 2002 was also characterised by a metaphorical, even a romantic detachment from the overwhelming burden of civilisation, as he arrived at a fountain near the "white-collar" Sony Centre dressed in a formal suit and equipped with all the props of a businessman and proceeded to remove his clothes, discarding all these symbols - the suit, mobile phone, briefcase. The resulting image was that of a white collar worker who has abandoned his identity (Self-Portrait as Businessman, 2002). The So Called Waves and Other Phenomena of the Mind (2003-2004) is a series of films recorded with fellow artist Artur Żmijewski that recalls Althamer's student-era work. The films document Althamer exploring various ways of non-rational cognition, which he deems to be a means of broadening human perception, using mind-altering substances (LSD, peyote, hashish, the truth serum) or hypnosis. During one of the hypnosis sessions shown in the film, the artist returns to one of his earlier incarnations, becoming Abram, a small boy wandering around the ruins of the Warsaw ghetto with his dog, Burek. Althamer represented the vision in the sculpture Abram and Buruś (2007), made of bronze and meant to be displayed outdoors. The boy figure holds a real-life wooden stick that dog walkers can use to play with their own pets. One of the films of the So Called Waves... series is Weronika (2004), showing the artist "discover the world anew" during a walk with his daughter. In many of his works and actions, Althamer tries to persuade the viewers to perceive the world around them more creatively. Another manifestation of this idea is the Observer (1995), a figure sculpted out of wire mesh which surveys the world through a camera. An attempt to perceive the world with a "fresh eye" was the premise for the artist's 1995 action in Bydgoszcz, where he played an Astronaut exploring a new planet. The artist walked around the city dressed in a homemade spacesuit, recording what he saw with a video camera. The recorded image was shown live on a monitor mounted on the artist's back. Althamer has often challenged stereotypical notions of a particular place by completely redesigning the gallery space or manipulating the viewer's perception of it. During his first solo exhibition (titled, somewhat perversely, The Exhibition, 1991), he restored Płock's Galeria a.r.t., run by fellow student Jacek Markiewicz, to its original function. He cleaned the place, washed the floor, scraped the white paint off the tile stove, and brought in the necessary pieces of furniture so that the gallery became once again the apartment it used to be. The artist spent several days there, recording the neighbours' daily life onto video. In 1996, Althamer transformed the cramped space of Foksal Gallery into a kind of waiting room, covering the floor with white linoleum, mounting white bus seats and adding an extra glass door. When you entered the space, you found out that it led you outside, to a small garden, through a hole knocked out in the wall in the area usually reserved for exhibitions. The installation was later likened to a decompression chamber or a meditation room. Three years later, in 1999, the artist created a frame for viewing a fragment of the park and courtyard adjoining the Foksal Gallery building by covering them with a large white tent. Remaining there for two early-spring months, the tent interrupted natural plant growth. 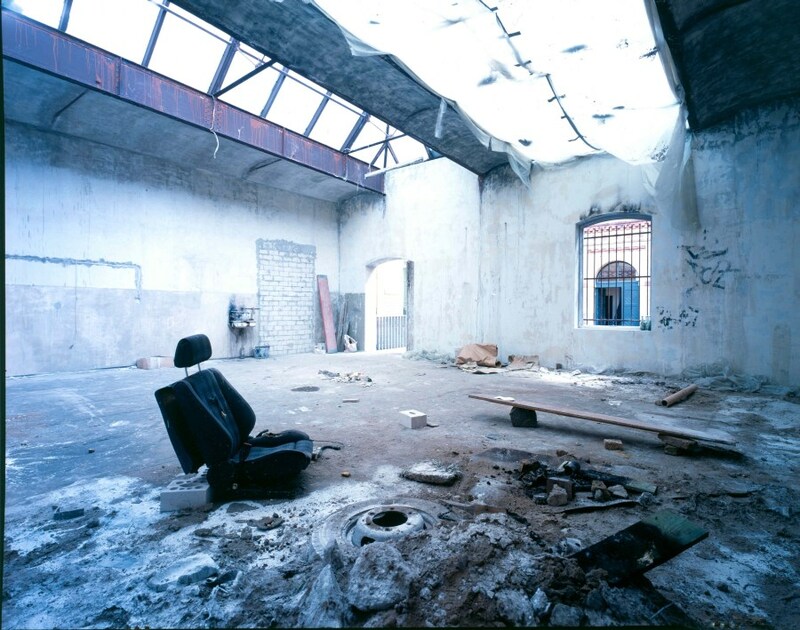 At another time, Althamer transformed the space of the prestigious Berlin gallery, the Neugerriemschneider, into a picturesque ruin (2003). The gallery remained open (or rather desolate) 24 hours a day, which was interpreted as a vanitas theme, or even a pessimistic forecast for the "art world". Another "discovery" project was the Path set down through a field by the artist during the Skulptur Projekte in Münster in 2007. Althamer's video projects were his broadest attempt at a "creative" perception of reality on the basis of illusion. The artist made use of this method for the first time in 2000 during the "Manifesta" in Ljubljana. Every day for three weeks ten hired actors were paid to "enact reality" to the accompaniment of music played on oboe by a street busker (Motion Picture). In 2001, Althamer invited the audience of a lecture he was to deliver at the Centre for Contemporary Art in Warsaw for a short Walk. At its end, participants were handed itineraries which revealed that some of the reality they had passed on their way was orchestrated, played out by hired actors. The concept's subsequent realisations provided for well-known actors to participate. And so in Pittsburgh in 2004, Peter Fonda played a passer-by, while in 2005 Mirosław Baka and Agnieszka Grochowska were featured in Warsaw (Film) and in 2007 Jude Law played a man buying a fish at a London market (Real Time Movie). In all three films, the "film" screened in reality was announced by trailers, which anticipated reality, as it were, because the films they advertised simply did not exist. Thus the "real" reality was mixed with an orchestrated one whilst proving itself just as interesting. In effect, every participant in the event had become a filmmaker "shooting" a movie from his own point of view. Many of Althamer's projects mixed reality with art, making art part of reality or using it as a pretext for action. That was the case in 2000 when the artist asked the residents of a large tower block in Warsaw's Bródno district to turn the lights in each apartment either on or off so that they formed the pattern of numbers "2000" (Bródno 2000), turning a happening into a sort of local community event. Althamer has often hired people unconnected in any way with the art world to participate in his action pieces. As early as in 1992, he hired homeless people to stand on the street as "observers" as part of a promotional campaign for the daily newspaper "Obserwator codzienny". For his happening/installation Astronaut 2 at Documenta X in Kassel, Althamer hired a man to live for the duration of the show in a trailer that had been converted into a living space. The man, as the alter ego of the artist, was also an "alien" in the sense of being an immigrant. During Althamer's exhibition in Chicago in 2001 featured the artist's friend from high school, another Polish immigrant living in the US who earned his living as a wall painter. For this work, he painted d the gallery's walls a different colour every day for several days. Another time, Althamer invited immigrants dressed up as curators for the opening of the show Neue Welt in Frankfurt in 2001. For his show at New York's Wrong Gallery in 2003, he hired couple of illegal immigrants first to ruin and then repair the gallery's main door and a composition arranged by the artist. British theoretician and curator Claire Bishop counts Althamer in the company of artists, such as Artur Żmijewski, Santiago Sierra or Phil Collins, who operate through other people, involving them in their actions on the basis of collaboration or mediation, which Bishops terms "delegated performance". What separates Althamer's works from those of, for instance, Sierra, is that he focuses his efforts on the aspects of cooperation, pleasure, and fun rather than on an a potentially ambiguous situation in which a person is either assisted or exploited. For the Award Ceremony for the Van Gogh Prize in Maastricht, for instance, Althamer brought along a group of teenage "homeboys" from Bródno. He has also carried out numerous projects together with Grupa Nowolipie, where he teaches ceramics workshops. Among their joint projects was Double Agent, curated by Claire Bishop. The exhibition featured ceramic pieces created by Althamer's students, along with two films made during the workshop: Do It Yourself (2004), a collaboration with Artur Żmijewski, and Flight (2007), which showed the Grupa Nowolipie members take a sightseeing tour over Warsaw aboard an old biplane. In certain instances, Althamer withdraws from his works to create room for others. He turned his solo show Au Centre Pompidou at Centre Pompidou in Paris in 2006 into a group show featuring eleven young artists based in France who were given equal space for exhibiting their works. The show was preceded by workshops in Poland and France. By challenging the notion of the "art-world celebrity", Althamer was able to make it possible for a number of young artists to debut in France's leading exhibition space. Similarly, in 2006, Althamer and Żmijewski turned down invitations for solo shows at CCA Ujazdowski Castle in Warsaw on behalf of a project called Elections.pl and invited the former Kowalnia students to participate. The project was built on Kowalnia's flagship exercise known as Common Space - Private Space, an exercise in non-verbal communication. This time it was carried out outside of the academic context in cooperation with members of the Grupa Nowolipie and some pre-schoolers. Ever since 2009 Paweł Althamer has been working with social sculptures, by getting individuals or groups involved with his projects. The projects often involved a re-location of context and one’s position within it. The form of his works would also be itself reappropriated and rewritten from one context to another. In 2009, he once again collaborated with his neighbours, this time it was to create a piece called Common Task. For this endeavour, volunteers from the Krasnobrodzka 13 high-rise would walk around the area, dressed up in golden costumes, as if they were strangers to their own home – the happening would draw on a science fiction narrative. The same project continued when a large group of participants from the same district travelled to Brussels in a golden Boeing 737, designed by the artist. This part of project was conceived for and carried out on the 4th of June, when the group, dressed up in their golden gowns, animated the crowd at the Expo 58 pavilion, the symbol of a universe brought into one unit. The incomers would remind and survey the passers-by about the events of the 1989 democratic elections in Poland. Althamer revisited the Common Task and its idea of social transformation in the context of travel and communal experience several more times: in 2011 he invited inhabitants of Broniów and Ostałówek (Southern Mazowia, Szydłowiec County) to travel in a golden bus, which would also host workshops and special events (Dreamer); in 2012 he travelled with his fellow participants to Minsk, on which occasion Althamer also organized a concert by the Belarussian band N.R.M., and accompanying Polish musicians, to draw attention to the political events in that country (Sunbeam). Althamer made another journey with his neighbours in 2009, returning, after almost 20 years, to Mali, to the land of Dogons, where he met with a local sculptor, Yossouf Dara. This encounter led him to his next project – Toguna, realized in Bródno Sculpture Park in Warsaw. He invited Dara to build a toguna in Warsaw, a construction, which is destined for social gatherings in the culture of Dogons. The hut, having a highly symbolic status in its original culture, was to serve Warsaw residents to prosaic ends: as a bus stop. At the Berlin Biennale in 2012, Althamer initiated Draftsmen’s Congress, which encouraged the visitors to draw on the walls of the empty St. Elisabeth Church in Berlin. The project can be reffered to Artur Żmijewski’s (the 7th Berlin Biennale curator) 2007 video Them, as it opens a space for drawing as a political tool, although Althamer’s approach is based on less antagonistic assumptions than his fellow artist‘s. Althamer decided to give voice to the images, believing this ‘common space’ to be bonding and enabling democratic debate, within which everyone is equal. In 2011, Althamer launched Almech during his commissioned project at Deutsche Guggenheim in Berlin. The project consisted in relocating his father’s plastics factory from Wesoła, Poland to Germany, and creating a temporary workshop at the gallery. Throughout the duration of the project, the artist would take cast portraits of the Deutsche Guggenheim, Deutsche Bank, and Guggenheim Foundation staff, as well as of the museumgoers, and combine does with bodies created according to his own imagination. In this way, Althamer was aiming to create a group portrait of a community gathered around this arena. Since the realization of Almech, he has continued to work with polyethylene as a medium, creating similar site-specific actions in Poland and abroad. A sculpture in a similar key, depicting the staff of Museum of Modern Art in Warsaw, pulling the unrealized design for the Museum’s much anticipated building (Barge-Haulers), is now part of its permanent collection, and has been featured at the large-scale exhibition In the Heart of the Country. In January 2013 he received the Kairos Prize of the Alfred Toepfer Foundation based in Germany in honour of how his artistic works reflect values significant for humanity. During 2013's Performa 13, the most important biennale presenting visual art and performance, Pawel Althamer created a collaborative project as part of Poland’s Pavilion Without Walls to which he invited local residents, members of his family and American artist Noah Fischer. The participants were invited to performances and meals at Biba Bar (run by a Polissh emigrant). The project culminated in the completion of a 50-foot long steel and mixed media statue, The Queen Mother of Reality, erected on the waterfront. Althamer organized workshops with assistance from his sons Bruno (a sculptor) and Szymon (a chef), which were followed by many events and talks talking place in Biba Bar with the participation of Noah Fisher representing the Occupy Museums Movement. The Draftsmen’s Congress is a continuous meeting of people who talk using images instead of words. Everyone is invited to join the discussion through paint, charcoal, collage, and other traditional materials and techniques, and react to issues like current politics, symbols of power, religion, economic disasters, and so on. Not happy with what other people paint? Use a paintbrush to cover their images or draw your comments next to them. […] Be polite or politically incorrect, frustrated or outraged, and fight others in a visual battle. Draw your love, your hate, your opinions and demands. Spit out the truth and speak out.